In the April 2013 issue of the Ensign, the section “What We Believe” is about receiving the gift of the Holy Ghost. It is on pg. 10-11. Hooray! We have a moment that LDS teachings are fairly consistent with the Bible! 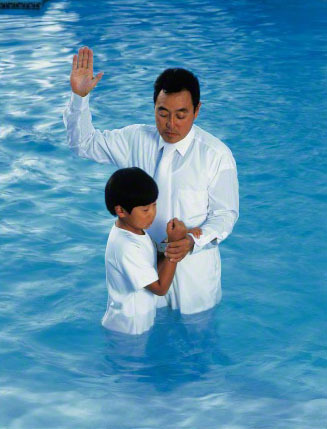 Baptism does not need to come first. Here is an example in the Bible where people received the Holy Spirit first, and then they got baptized second. “While Peter was still speaking these words, the Holy Spirit fell upon all those who were listening to the message. All the circumcised believers who came with Peter were amazed, because the gift of the Holy Spirit had been poured out on the Gentiles also. For they were hearing them speaking with tongues and exalting God. The LDS call this the “gift” of the Holy Ghost. What kind of a “gift” is that? It’s not really a gift at all. You can only have it when you have earned it. If that’s the case, then for my daughter’s birthday, I think I’ll get her a brand new car – as soon as she earns the money to pay for it. Nice gift, right? NO! That’s not a gift at all. Another problem with this teaching is that the LDS Church teaches its members that they can actually BE worthy. So do LDS leaders teach their members to just ignore the Bible? Or maybe just ignore the parts that they don’t like? Or do they teach that God didn’t really mean that verse? Or do they teach that there are none righteous, except Mormons who are trying their best? Either way, it’s denying the word of God. If anyone thinks that their good works or obedience to laws and ordinances makes them worthy… or if they think they could possibly be without sin for even a fraction of a second…the Bible tells them they are lying. Therefore, they are sinning, so they are not worthy anymore. This is not how the Bible says we get the Holy Spirit in us (by being worthy). The Holy Spirit enters into a believer the moment he or she exercises a saving faith in Christ. And the Holy Spirit stays there forever. This is saying that if you do not have the Holy Spirit, you do not belong to Christ. So if LDS teachings are right, and you don’t always have the Holy Spirit with you, but only have it when you’re “worthy”, then you don’t belong to Christ most of the time. Or at least some of the time. (None of the time, if you truly understand that you cannot ever be worthy.) So I ask Mormons – Who do you belong to during those times when you are a little short of being worthy and the Holy Spirit isn’t dwelling in you? Was Jesus lying? Because he isn’t here with us. No, he was not lying… he sent the Holy Spirit to be with us. He is with us through the Holy Spirit. He did not say he would be with us only at the times we are worthy. He said he would be with us ALWAYS. To the LDS reader: Have you entered into that saving faith? Have you been born again? Please trust God and His word to teach you truth. In the April 2013 issue of the Ensign, the LDS religion FAILS this test.